Many of the exhibitor booths at ISH, like this one by plumbing manufacturer Grohe, are huge. 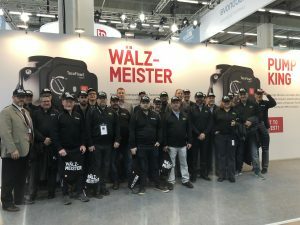 Plumbing & HVAC recently attended the ISH show in Frankfurt, Germany – something that everyone in the mechanical industry should do at least once in their lives. 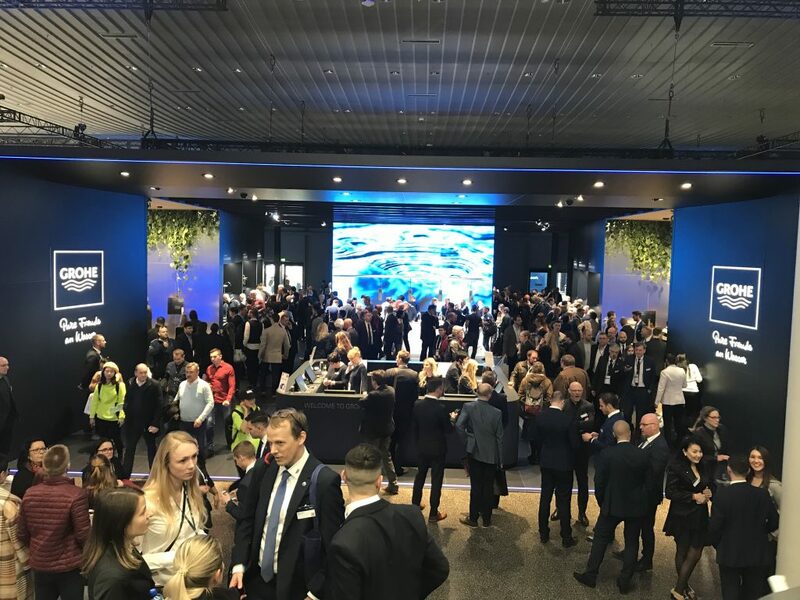 Billed as the “world’s leading trade fair for HVAC and water,” it took place March 11-15, drawing about 190,000 visitors from 161 countries, including 600 from Canada. That’s up from 500 for the last ISH show in 2017, reported organizers. There were 2532 exhibitors, including four Canadian companies, in 12 buildings covering 275,000 sq. meters of exhibit space. The buildings were divided by product category. Uponor Canada general manager Charlie Harte, right, explains the company’s technology to visitors. Immediately noticeable was the size and scope of the show. Some of the booths were huge, multi-level giants that would dwarf any booth seen at a North American event. Many served food, encouraging attendees to spend more time learning about their products. Surprisingly, there were many companies not seen in North America. 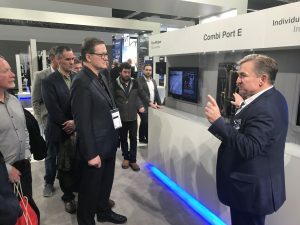 In addition, even with companies active in North America, some of the technology seen at the show will not come to this side of the Atlantic for a year or two. Plumbing & HVAC will highlight some of the ISH products in our next issue. It seemed clear that Europe and North America have embraced different technologies in many areas. Taco and Weil-McLain Canada brought 30 Canadian engineers and contractors to the show. Advancements in Europe, where energy costs are much higher and homes are smaller, are being driven by the need to save space and reduce energy consumption. Taco and Weil McLain Canada organized a trip for some 30 lucky contractors and engineers from across Canada. They spent two days at the show learning about new products and technologies. They also toured Kronberg Castle and continued on to Berlin for sightseeing and other adventures, including a Trabi Safari – in Trabants, a cheap, poorly made East German car that has developed a cult following (Wikipedia,) – to explore the Berlin wall. A soccer match at Berlin Olympic Stadium was also on the agenda. The next ISH show will take place in Frankfurt March 22-26, 2021. Please visit https://ish.messefrankfurt.com/frankfurt/en for more information.